All materials and presentations that were shared with DOVIA Colorado by the workshop presenters are linked below - enjoy! professional should practice, then take a deeper dive into leveraging the role into an elevated career. The secret to maximizing your pay is knowing what you are worth. Do you know what to say and when to say it? Do you know how to ask? Talk about the value you deliver in relation to the business strategy. Make it easy for your leaders to say "yes"! *Note: Sessions are categorized into beginner, intermediate, and advanced. While these are suggestions, we believe anyone can benefit from the content shared in any session, so don't feel restricted one way or another! Focusing on proper use and treatment of volunteers and interns by non-profit and for-profit organizations to ensure compliance with federal and state wage and hour laws. This can be a tricky area of the law to navigate, and legal compliance is essential to avoid unnecessary confusion, missteps, and potential claims from volunteers or interns. Sometimes, we have questions or face challenges where we really need the help of a skilled consultant (but don't have the budget!). This will be a highly interactive session, with a robust Q&A as well as a short presentation about how to problem solve like a consultant. Bring your Qs, we'll have the As! Surveys are not always the best way to collect evaluation data. Sometimes we get the most illuminating, rich information from talking with people! Learn how to design and conduct interviews and focus groups from start to finish to make the best use of your - and your volunteers’ - time. We'll briefly explore what micro-aggressions are and how volunteers' intentions may not equal their impact. While they may mean well, volunteers may say things that communicate derogatory or negative messages to target persons, based upon their non-dominant identities. This interactive workshop will help volunteer coordinators recognize how others may be affected by our language, even if it's well-intended, & then craft activities to educate their volunteers about micro-aggressions. This session will help us to understand sexual harassment and how it can be displayed, to explore the #MeToo movement, to learn about problem behaviors and how to avoid them, to understand the responsibilities of the employee, and to prevent claims from happening. Active harmful events are rare, but when they happen they are frightening. This seminar will help you know how to react if you happen to be part of one and be better prepared in advance. All organizations think about volunteer retention. How are you defining volunteer retention for your organization and how do you measure it? 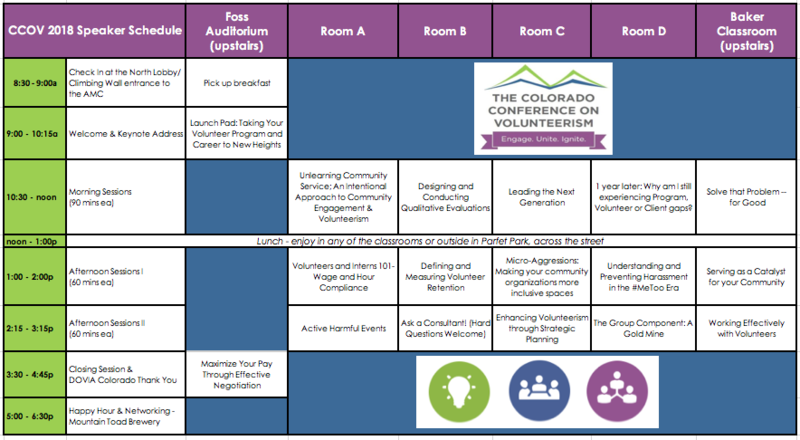 Using an example from Cooking Matters Colorado, we will discuss the process of defining volunteer retention for their context and present ideas for measuring retention based on that definition. Corporate and social volunteerism has a new set of rules in this fast-paced ever-changing field of Corporate Social Responsibility. Come learn about current trends of corporations and social groups, best practices for quality engagement, and proven ways to increase ongoing cultivation with all different types of groups. Does your program need a new vision? A new focus to re-engage and harness the passion of your community? Come learn how a stagnant disaster response and preparedness program was reshaped into a catalyst for neighborhood leaders. It is common for organizations to view volunteer engagement as a nice to have program as opposed to a strategy. At the City of Boulder, staff from across the organization have been working to change this culture through the development and implementation of a Volunteer Strategic Plan. Leading new professionals effectively in nonprofits ensures that our communities flourish and our effectiveness as community leaders continues into the future. While much has been said about the next generation, it remains difficult to both retain and rely on new talent. Based on years of leading and coaching new professionals, this sessio brings expertise, tactics, and long-term strategy to engage, unite, and ignite our future leaders. You will walk away with an action plan to implement your learning, and collectively we'll write-up a booklet on the topic to share with others. Sometimes staff need assistance understanding that “free help” doesn't mean there’s no investment on their end. To nurture staff-volunteer relations, the first step is to give staff the tools to best communicate with volunteers. Help staff fully embrace volunteers make by helping them feel comfortable in their interactions with volunteers. Has "Service Learning" lost its intention and meaning? Let's unlearn together as we explore the origins of true volunteerism and community engagement through a lens of equity and inclusiveness. We will explore the "savior syndrome" approach through rich dialogue and activities of what authentic support could look like in communities. 1 year later: Why am I still experiencing Program, Volunteer or Client gaps? In this 'Part II' (one year after the 2017 CCOV), we will refresh the Root-Case Analysis principles, and take a tactical approach to diagnosing organizational performance gaps. This session is most impactful if you already have a specific gap, or needed improvement. Do you often find yourself putting out fires? Are the same obstacles or problems coming up on repeat? FC Lean can help. This session is designed to provide participants with creative problem solving and process improvement tools that will enhance the way they design and administer volunteer programs. LEGEND - the below are suggested levels for each session. Don't view them as restrictions in any way - we encourage everyone to attend whatever speaks to you and to stretch & learn as much as possible from these amazing presenters. Introductory: Participants with minimum experience, usually less than two years in the volunteer engagement profession, have direct volunteer experience, or with the topic of volunteerism. Intermediate: Participants who have prior volunteer management or direct experience as a volunteer, designed for those with 2-5 years of experience. Advanced: Participants who are experienced in the volunteer engagement profession, direct experience as a volunteer, or the topic of volunteerism, designed for those with over 5 years of experience.